Nebraska offensive line coach Mike Cavanaugh’s influence on his players was apparent during Cole Conrad’s post-practice interview last week. Conrad punctuated his response to questions a half-dozen times with: “You know what I mean?” He has been paying attention. As we all do, Cavanaugh uses stock phrases during his interviews, including: “You know what I mean?” And it would seem Conrad knows what he means, which is the reason the junior is atop the depth chart at center after playing tackle until the second half of practice last spring. Conrad started the final five games last season at right tackle, stepping in for David Knevel, who was bothered by injury. He began the spring as a back-up tackle but finished, prominently, in the discussion of who would replace Dylan Utter at center. Utter is the offensive line’s only departed starter. Conrad, who walked on, redshirted and didn’t see action as a redshirt freshman, “might not be the starting right tackle, but he might be in the top five offensive linemen,” Coach Mike Riley said at spring’s end. And the idea is to get the five best offensive linemen on the field. It’s not quite as simple as that, of course. If Conrad didn’t have the aptitude for center, where he’d never played, even at Fremont (Neb.) Bergan High, his move would have been temporary. In addition to learning how to snap before blocking, no easy thing, he had to become comfortable making the line calls. That requires study and, again, paying close attention. “It definitely comes with a little bit of a challenge, but I’m embracing that and learning every day,” said Conrad. Sophomore Michael Decker also has the aptitude. As did Conrad, Decker earned first-team Academic All-Big Ten recognition last season, and like Conrad, he began his Husker career at another position, offensive guard, before moving to center as Utter’s top back-up in 2016. Redshirt freshman John Raridon took snaps at center during the spring as well but finished in competition with sophomore Jalin Barnett as the top back-up behind left guard Jerald Foster. As with players at other positions, cornerbacks for example, offensive linemen need short memories, the ability to set aside mistakes and move on to the next play. Cavanaugh emphasizes that. 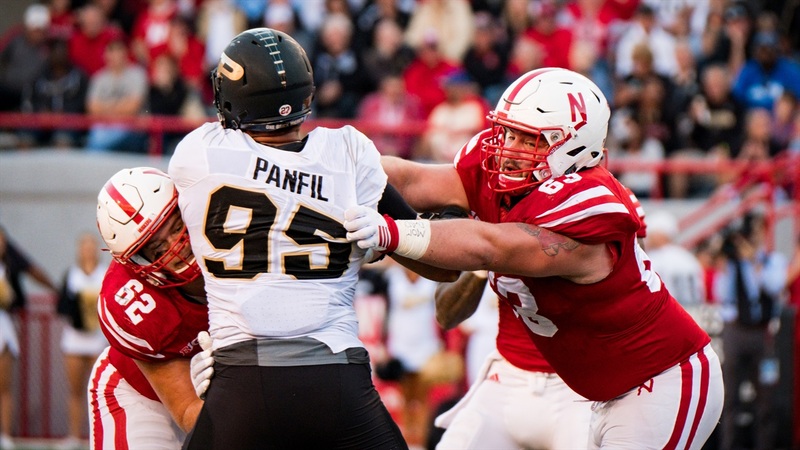 Though the same ability probably needs to apply from one game to the next, the veterans in the Husker line have used last season’s finish, in particular the Music City Bowl, as motivation during the off-season and now in fall camp. With Ryker Fyfe stepping in at quarterback for Tommy Armstrong Jr., Nebraska managed only 61 net yards rushing and allowed four sacks in its loss to Tennessee. “Moving into this season, we kind of remember that,” said Conrad. We do, or at least we should by now.